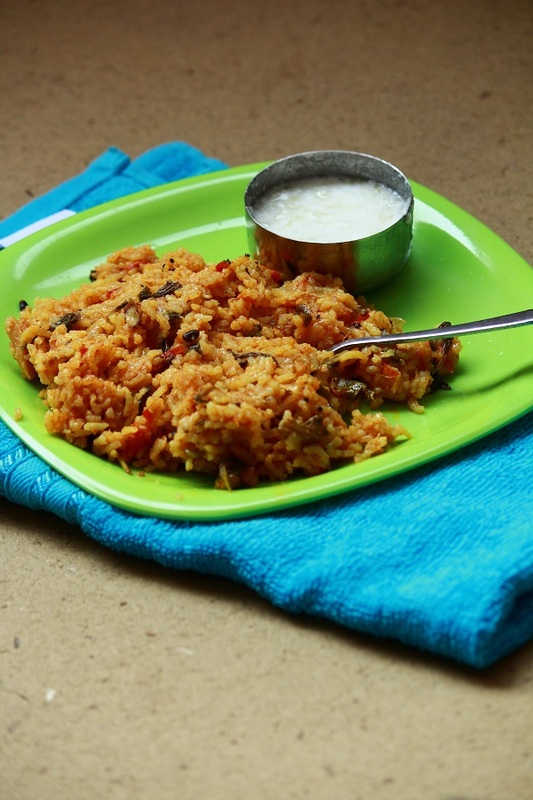 Tomato pulao – is an easy and tasty rice dish. Apart from being an easy to prepare rice dish, it is also tasty and can be easily packed. Serve it with some raita and done. I usually make tomato rice and serve it with cucumber raita. Now to the recipe…. 1. Wash and clean basmati rice. Soak in water for 15 – 20 minutes. Drain water, keep it aside. 2. Grind tomatoes, keep it aside. 3. In a pressure cooker, heat oil. Add cinnamon, cloves, fennel seeds, aniseed, bay leaf, and saute for few seconds. 4. Then add sliced onion and saute till it turns brownish in color. 5. Next, add ginger garlic paste and green chilies, saute till the raw smell goes off. 6. Now add chopped coriander leaves and mint leaves, saute well. 7. Next add tomato paste, red chilly powder and turmeric powder, saute well. 8. Then add water and salt. Let it start boiling. Once it starts boiling, add the drained rice, mix well. 9. Pressure cook for 10 minutes in low flame. Then turn off the flame. 10. Once pressure subsides, open the pressure cooker, fluff the rice with a fork. Serve it with raita.